The Rappaport Center for Law and Public Policy will move to Boston College Law School as a result of a $7.53 million gift from the Phyllis & Jerome Lyle Rappaport Foundation. The gift, the largest in the 85-year history of BC Law, will fund the Rappaport Center and the Jerome Lyle Rappaport Visiting Professorship in Law and Public Policy at BC Law. 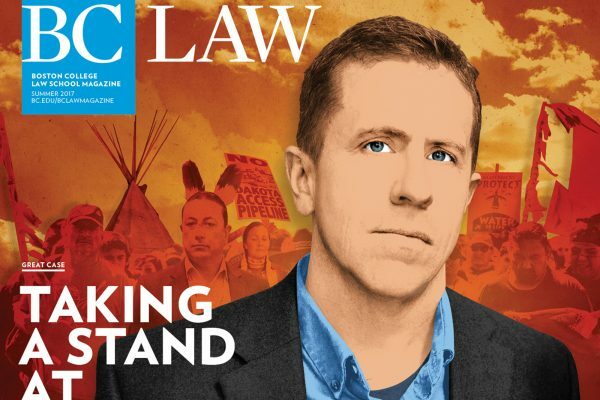 The acclaimed public policy law center, which began its work in 2000, provides educational programs, career mentoring and financial support to law students interested in government and public policy. The center focuses on public policy issues affecting Greater Boston and Massachusetts, and will house the popular Rappaport Fellows Program in Law and Public Policy, which provides 12 paid summer internships to talented law students from seven Greater Boston law schools interested in public service, and the Rappaport Distinguished Public Policy Series at BC Law, which will conduct scholarly research and host lectures, debates and roundtable discussions on public policy issues with the region’s leading policy makers and thought leaders. The center will work in close collaboration with the Rappaport Institute for Greater Boston at Harvard University. 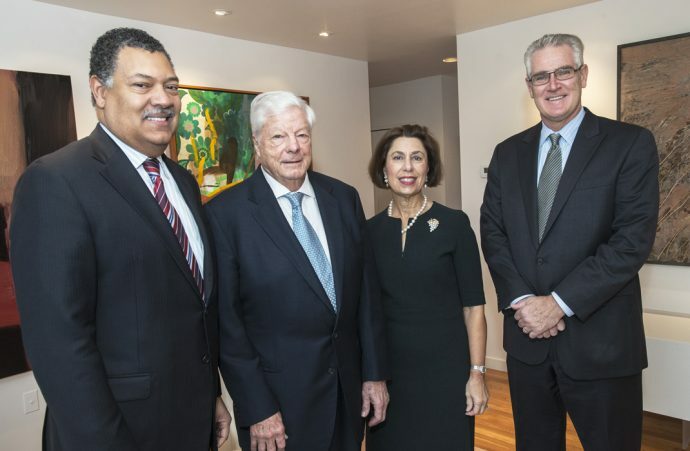 The Rappaport Center will be led by BC Law Professor R. Michael Cassidy (pictured at right above, with Dean Vincent Rougeau and Jerome & Phyllis Rappaport), who will hire an executive director to oversee its day-to-day operations. An advisory board, which is currently chaired by former Massachusetts Attorney General Scott Harshbarger, will help guide its work. Cassidy, who has held positions in public service ranging from Chief of the Criminal Bureau in the Massachusetts Attorney General’s Office to membership on the Massachusetts State Ethics Commission, said he was delighted to welcome the Rappaport Center to BC Law and to carry on its mission of public service. Boston College Law School Dean Vincent Rougeau said that the Rappaport Center will provide the Law School with the opportunity to promote public policy discussions and public interest law—longstanding components of the BC Law experience. This summer, the Rappaport Foundation announced its intention to relocate the center from Suffolk University, where many of its programs have existed for the past 15 years, to one of the area law schools from which it has drawn fellows. Boston College Law School, which has an extensive track record in training public policy leaders locally and nationally, was chosen by the Rappaport Foundation as the school best suited to host the center, which will open in the spring of 2015. The Rappaport Fellows Program will provide selected law school students from Boston College Law School, Boston University Law School, Harvard Law School, Northeastern University Law School, Suffolk University Law School, New England School of Law and University of Massachusetts School of Law with opportunities to experience the complexities and rewards of public policy work and public service at the highest levels of state and local government. The program includes coveted summer internships, during which students work with top policy makers and are mentored by the center’s staff and civic leaders and respected attorneys in the field. BC Law student Alaina Sullivan, who served as a Rappaport Fellow in 2012, praised the program for the opportunity it provides law students to embrace the virtues of public service. “The Rappaport Fellows Program promotes civic mindedness by encouraging its fellows to work directly on policy issues while embracing social consciousness both inside and outside of their daily work,” said Sullivan, current president of the BC Law Student Association, whose internship was within the Office of the General Counsel in the Massachusetts Department of Elementary and Secondary Education. In addition to the Fellows program, the Rappaport Distinguished Public Policy Series at BC Law will engage leading academics and public servants to discuss the commonwealth’s most critical public policy issues. The public discussions will include election-year debates as well as forums and symposia to address pressing societal issues with leaders from government, business, academe and the non-profit world. Jerry and Phyllis Rappaport, founder and chairperson, respectively, of the Phyllis & Jerome Lyle Rappaport Foundation, are well-known Boston philanthropists with a noted passion for public policy issues. Jerry Rappaport began his involvement in public policy while a student at Harvard College and Harvard Law School. After graduation he became an integral part of Mayor John B. Hynes’ campaign and subsequent administration. In 1950 he formed the New Boston Committee, an organization that became an essential element in revitalizing Boston. He has served on the boards of numerous civic, charitable and professional organizations. Jerry, along with his wife, Phyllis, founded the Rappaport Foundation in 1997. Its initiatives include the Rappaport Institute for Greater Boston at Harvard University and the Rappaport Fellowships at McLean Hospital, Massachusetts General Hospital, and Brigham and Women’s Hospital. It also endowed the Rappaport Prize at the deCordova Sculpture Park and Museum, an annual award to a promising artist with ties to New England. Phyllis Rappaport also serves on advisory boards to several non-profit research institutions. With two other partners she founded Cure Alzheimer’s Fund, the preeminent research-focused entity devoted solely to finding a cure for Alzheimer’s disease.